Each year, businesses and individuals that contribute to the island experience in extraordinary ways are honored with awards presented by the Palm Beach Chamber of Commerce. This year’s slate of winners will be recognized for their superlative efforts April 12 at the Chamber’s annual season-closing breakfast meeting at The Breakers. “These honorees represent the diversity and distinctive character of the Palm Beach business community — from those entities with long-standing traditions that continue to thrive to the new businesses that have quickly made a contribution to the vitality of this community,” said Chamber president Denise Bober. Recommendations for this year’s awards recipients were sought in January, with a selection committee appointed by Bober choosing winners in February, said Laurel Baker, executive director of the Chamber of Commerce. “Those recognized this year all make a contribution to what could be called the Palm Beach brand,” Baker said. The committee chose Café Via Flora, which debuted off Worth Avenue last summer, as best new business. As if a morning on Worth Avenue wasn’t special enough (it is) – just driving past the ocean puts you in the mood for a grand day. But then after you’ve strolled down the most luxurious street in our humble county, peering in at the elegant displays, dreaming of yourself squeezed into a Hervé Léger or a prancing around in a flowing Badgley Mischka, perhaps stopping in for a present or a splurge – task yourself with finding Café Via Flora. I think of it as my secret garden (café). I never quite remember where it is. Finding it requires poking into the oft-overlooked Via, which only adds to the fun. Pass the quaint sculptures once you do find it, and settle outside under an umbrella as an afternoon (or evening) of yummies and majestic quiet awaits you. Café Via Flora’s extensive menu offers choices from light and alluring salads such as beet with arugula, spinach and romaine with orange and maple-roasted pecans, red onion and gorgonzola cheese to creative sandwiches. (I fell in love with the smoked Norwegian salmon and brie, $13.95.) There are heartier classics, such as a filling Ravioli alla Vodka ($13.95) or Fish and Chips ($16.95). In addition, there are a few different hamburgers, Bresaola ($14.95), Beef Carpaccio ($14.95), or intriguing Prosciuttio-Wrapped Dates stuffed with Manchego cheese and drizzled with aged balsamic reduction ($8.95). What I’m trying to say: While it’s a dainty, lovely, sweet place, come hungry and order lots. Portions are generous, prices are reasonable (for Worth) and the quiet beauty of it will leave you lingering far into the afternoon into a second cappuccino. 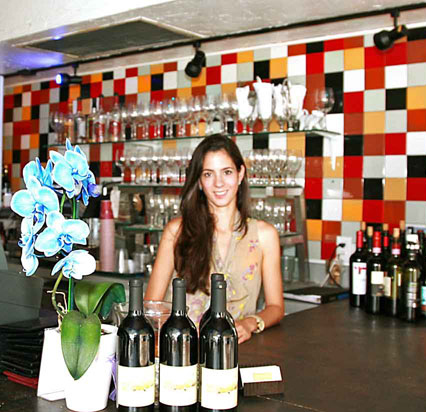 Café Via Flora: at 240 Worth Avenue, Palm Beach (behind Jimmy Choo and Hermes); 561-514-4959; open daily from 10 a.m. to 9 p.m.
Miami City Ballet’s Artist’s Circle, a members-only corps of Palm Beach County supporters recently celebrated the dance troupe’s 2011/2012 stellar season finale at the romantic Mediterranean eatery, Cafe Via Flora, located at 240 Worth Avenue. 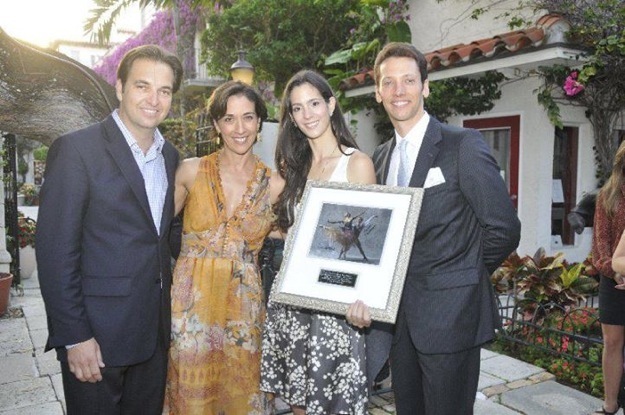 Voted the “Best New Business” by the Palm Beach Chamber of Commerce and tucked into one of the most picturesque vias on the famous street, Cafe Via Flora hosted Miami City Ballet’s Palm Beach leadership for its pre-performance reception on April 13th prior to the full-length opening night production of Coppélia. Pamela Lomba, pictured above, owns Café Via Flora with her husband Heinrich Lowenberg. 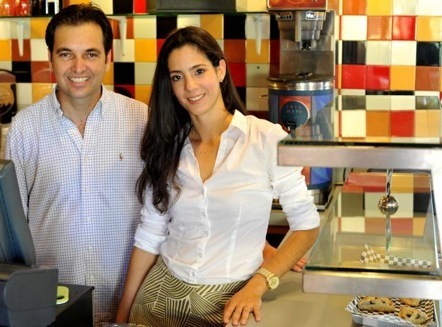 Having begun as a small take-out venue, Café Via Flora recently expanded to a 50-seat casual Italian-style café open for breakfast, lunch and dinner, garnering the Chamber of Commerce 2012 Award for Best New Business on Palm Beach. A few hours after the Palm Beach Chamber of Commerce’s annual season-closing meeting and awards ceremony tomorrow morning at The Breakers, Cafe Via Flora will celebrate its best-new-business win by offering a complimentary nicety to visitors. Between noon and 6 p.m. Thursday, anyone who drops by the counter at the 50-seat indoor-outdoor cafe (240 Worth Ave.; 514-4959) will receive a complimentary glass of prosecco. 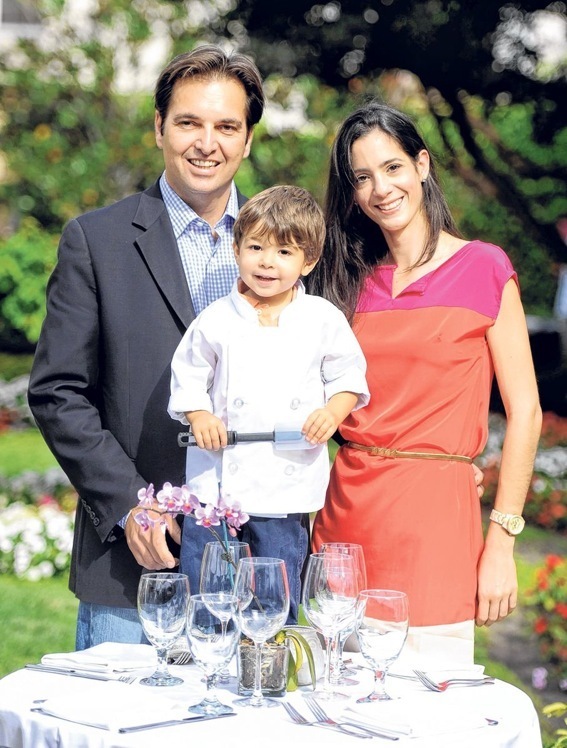 “Especially for people who have been regulars with us, this is a way to thank them,” says Pamela Lomba, who co-owns Cafe Via Flora with her restaurateur-husband, Heinrich Lowenberg (the two are shown above). Other island restaurants receiving a Chamber award tomorrow include Buccan, honored as Palm Beach’s best new restaurant. Buccan opened in January 2011.